Beginning in April of 2007, the United States Post Office began to issue Forever Stamps. These United States first-class postage stamps will forever maintain the stamps value to mail a one-ounce first-class letter. The Forever Stamp program was created to help postal service customers deal with the inevitability of the price of stamps going up and postal rate stamps price hikes that follow. 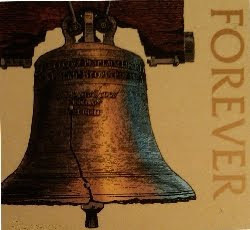 The first Forever Stamp issued by the postal service features an image of the Liberty Bell and the forever stamps cost is the same stamps price as the regular first class mail US postage stamps issued by the US Postal Service. Forever Stamps are sold at the current price of stamps equivalent to the normal first class mail postage stamp. 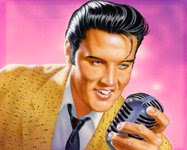 Stamp Catalogue's free online stamps price guide provides forever stamps cost and current stamps price for letter, large envelopes and packages for USPS first-class mail delivery service within the domestic United States. 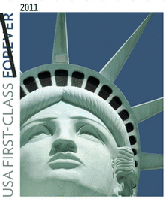 Postal customers should note that Forever Stamps can also be used for international mail. Postage varies depending on the country of destination for the mail and additional postage will have to be attached to make up the difference. The stamps value is that of the domestic first class mail letter price in effect on the day the forever stamp is used. 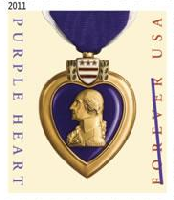 The Stamps Program for 2011 included forever stamps 2011 to honor people who serve in the US military with the issuance of the Purple Heart with Ribbon forever stamp and also a Statue of Liberty Stamp purported to feature an image of the statue in New York harbor, but instead featured a photo of a Las Vegas casino's replica Statue of Liberty. So avoid the stamps price hike and purchase Forever Stamps for mailing domestic first-class letters within the United States.